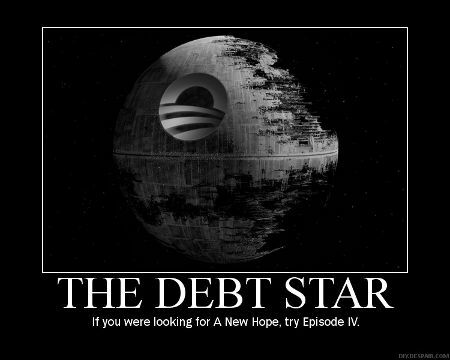 So, Obama-Wan Kenobi’s attempt to employ the hope-and-change Jedi mind-trick that “These aren’t the bonds you’re looking for” with the rating agencies aligned with the Dark Side has failed. We warned here a couple weeks back that an insufficient debt ceiling agreement would actually make a downgrade more likely, and as John points out, the left’s attempt to blame this on the Tea Party is laughable. On the surface it is supposed that the Darth Vaders of Standard & Poor’s are engaged in a belated CYA operation after having failed to raise an eyebrow about the bubblicious creditworthiness of housing finance a few years back, or otherwise have it out for Obama out of some partisan animus. But wait!—it turns out S & P executives were overwhelmingly Obama donors in 2008. This compounds the embarrassment of Obama-Wan Kenobe’s chief Padawan, Tim Geithner, who assured us just last April that there was “no chance” of a ratings downgrade. Now, Obama has successfully begged Geithner to stay on as Treasury Secretary, no doubt fearing a bruising Senate confirmation fight for any possible successor, since no one has the same Turbo-(Tax) charged Midichlorians as Master Geithner. The political brinksmanship of recent months highlights what we see as America’s governance and policymaking becoming less stable, less effective, and less predictable than what we previously believed. The statutory debt ceiling and the threat of default have become political bargaining chips in the debate over fiscal policy. Despite this year’s wide-ranging debate, in our view, the differences between political parties have proven to be extraordinarily difficult to bridge, and, as we see it, the resulting agreement fell well short of the comprehensive fiscal consolidation program that some proponents had envisaged until quite recently. . . Our opinion is that elected officials remain wary of tackling the structural issues required to effectively address the rising U.S. public debt burden in a manner consistent with a ‘AAA’ rating and with ‘AAA’ rated sovereign peers. The last sentence is the most salient here: S & P now gives AAA-ratings to our major European peers, chiefly because their parliamentary systems are thought more able to adopt tough measures, while the “gridlocked” U.S. system isn’t. Now those S & P donations to Obama suddenly make sense: S & P apparently share’s liberalism’s bias toward more “effective” governing structures that in practice mean more powerful governing strictures. There is a legitimate question facing the entire democratic world, whether popular government in any form can take unpopular measures, regardless of institutional form. American liberals since Woodrow Wilson have envied parliamentary governments for their supposed greater unity of political structure and “effectiveness.” Despite the current example of effective austerity regimes Britain and Germany have set in motion, it isn’t at all clear that parliamentary forms are actually superior to our scheme of bicameralism and separated powers. After all, one reason the European welfare states grew rapidly more extensive than ours is precisely the “effectiveness” of parliamentary forms. Churchill eventually turned away from this kind of progressive thinking, as he would from other forms of pessimism that gripped him in the 1930s. Will S & P, and the American people? Not unless Congress and the president step up big. But we surely need a different president for that to happen, and we probably need a better Congress, even more so than the House we have now. I say, let the downgrades continue. It may be the only thing that makes our political class wake up.